This pre-dawn impression catches two paddle boarders leaving Lanikai Beach. They are headed towards the Na Mokulua, commonly called The Mokes or Twin Islands, and surf both three quarters of a mile away. 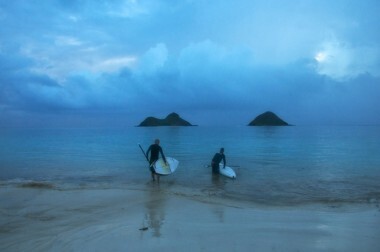 The rare stillness on windward coast of O’ahu and mystical blues of the morning make for a magical moment. A L O H A from the twin islands.